The second leg of the relief material collection drive organised by Supreme Court advocates in the wake of the natural calamity that has befallen the state of Kerala is presently underway opposite the apex court premises. 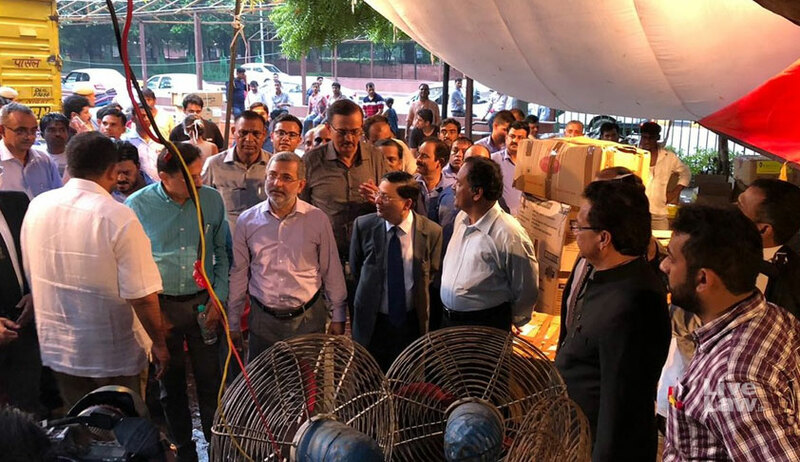 The drive, which began at 5 PM and shall continue till 11, was graced by the presence of CJI Dipak Misra, Supreme Court Justice Kurian Joseph and Delhi High Court Chief Justice Rajendra Menon who came to offer their support. Also seen were Supreme Court Bar Association President and Senior Advocate Vikas Singh and Senior Counsel V. Giri. Chief Justice Misra hailed the lawyers for their act of humanity and Justice Joseph actively participated in the activities at the collection point. The materials being collected on Wednesday include toiletries, bedding, brand new readymade garments, chlorine, mosquito nets, gloves, face masks and toys to cheer up children. The expectation is to gather upto 50 tonnes of materials for mobilisation in flood-ravaged Kerala. In the first round held on August 18, eatables like biscuits, rusks, ‘maida’ and ‘dal’ were collected. The navy has allocated a special aircraft to distribute the relief materials in Kerala. Earlier this week, the Supreme Court judges undertook to contribute Rs. 25,000 each to the Kerala flood relief fund. In fact, Attorney General K. K. Venugopal, having made a contribution of Rs. 1 crore himself, had suggested that the fine to be imposed on a litigant for casting aspersions on Chief Justice Misra be diverted to the relief funds. The south-Indian state is facing an unprecedented crisis, as it is hit by the worst floods in 100 years. After heavy monsoon downpour, 35 dams have been opened and 44 rivers are overflowing, deluging most towns of the state across its length and breadth, resulting in a loss of about 300 lives. More than 3 lakh homes and 10,000 kilometers of road have been destroyed. The loss caused is estimated to be about Rs. 19,000 crores. As many as 82,000 persons are reported to have been displaced and shifted to relief camps in the last few days. Relief and rescue operations are being undertaken by teams under the National Disaster Response Force.